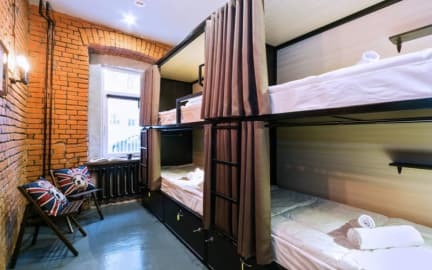 Hostel77 i Moskva, Rusland: Reservér nu! Hostel77 is located in historical and business center of Moscow, 300 metres from Pushkinskaya subway. 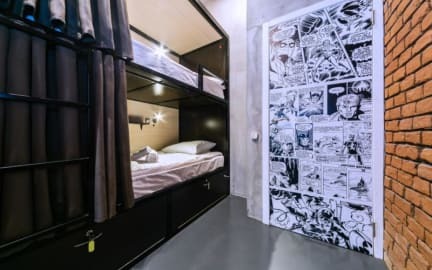 The interior of the hostel designed in style LOFT. Many interior items handmade that makes it individual. For special connoisseurs of culture within walking distance are the Pushkin theatre, the State Theatre of Nations, Gorky Moscow art theatre Concert hall Tchaikovsky. In our hostel we create an atmosphere and comfort, providing a comfortable accommodation, so you can feel at home. It offers cosy of 8, 6 and 4 bed rooms and a separate comfortable family room. Comfortable beds with orthopedic mattresses and individual bedside LED lamps. Each bed has an individual locker with a key. In shared bathrooms, free Wi-Fi and hour front Desk. A daily maid service. Also it offers a large TV with HD channels, refrigerator, electric kettle, microwave, toaster and washer / dryer. If you travel a company, we can offer you a variety of Board games. Payment upon arrival by cash and Visa.